Worlds don’t collide in the latest of our ongoing series with champion competition shooter Rob Leatham and defensive shooter Rob Pincus. 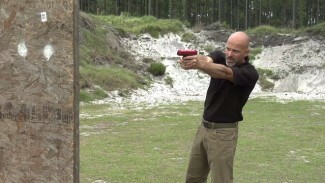 This installment is strictly about defensive shooting, in particular what is the best home defense weapon. 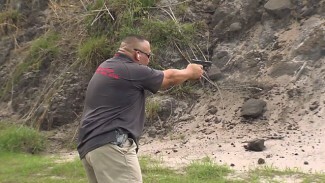 Both Robs agree that any rifle is better than any pistol in terms of accuracy, power, stability, and deviation control. 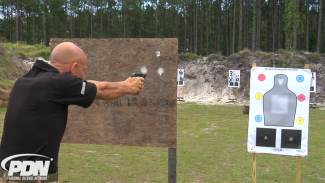 If Rob Leatham is conducting handgun training and a student can’t shoot the handgun, he recommends they take up the rifle and do some rifle training instead. So why wouldn’t you always choose a rifle instead of a pistol? First, you can’t always have a rifle, due to legal restrictions, and second, in some places and circumstances, your mobility is better with a handgun than a rifle. For example, in a home defense situation, you may not have enough room to maneuver with a rifle, especially around corners, and a handgun is the better choice. But if you’re stationary, both Robs would choose a rifle. 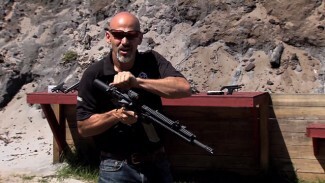 Rob Pincus explains that, if you’ve reached the barricade point in your house, your family is behind you, and you can shoot from a stationary position, with a rifle you can feel confident of getting hits on the bad guy(s). But if you need to move around, both Robs would choose a pistol. You can control a pistol better when moving around corners. Rob Leatham doesn’t have any rifles staged in the front part of his house. The rifles are in the fall-back areas, where he would be firing them from a stationary position. The handguns are up front so he can shoot them while moving through the house if necessary. What is the best home defense weapon — a rifle or a handgun? Better have both. Good advice that I had not considered before. I haven’t bought a long gun because I felt a pistol or shotgun would be better for home defense. After hearing how the neighbor responded with a rifle to the church shooting in Texas, I have been having second thoughts as well. I agree with the points mentioned. I personally use short 12 ga shot gun with a high brass bird shot. Strong enough to do a world of damage to a person, need to be extremely accurate is not as great, and the bird shot will not penetrate two layers of sheet rock so it should stay confined to a single room…. Through in a pump and the mere sound of ratcheting the next round into the chamber is likely enough to make many people run from the area. Any thoughts? Thank you for your insight into the lines of defense. This will help us at home and with our church security strategy. Our security plan is in process of being activated. In light of the past weekend event none too soon. Thank you for such timely information. I just can not believe he set that rifle down with the tip of the barrel against the ground! !